Funny money is no laughing matter when parents get the credit card bill. Here is the proof. A federal class-action lawsuit against Apple claims Apple is complicit in a scheme to get kids to buy level-ups and game credits "in games it promoted ... to children as ‘free.'" Garen Meguerian, an attorney in suburban Philadelphia, is suing Apple because his daughter racked up $200 in a few days, playing games like City Story and Tap Fish on an iPod Touch. The suit, filed April 11 in U.S. District Court in San Francisco, focuses on apps for children and the in-app extras they contain, including City Story's virtual cash, Sundae Maker's virtual ice cream and Tap Fish's "fish bucks." In the pleadings, lead attorney Jonathan Shub of the Philadelphia law firm Seeger Weiss LLP calls in-app purchases of game currency a "bait and switch" that preys on kids who may not understand that there ain't nothing free in this world. "Many games are, by design, highly addictive, and are developed strategically to induce purchases of Game Currency. For example, the game ‘Smurfs' Village' is free to download. The object of the game, however, is to build a virtual village, and the construction process is greatly sped up by the purchase of ‘Smurfberries,' Game Currency that costs real money. ... [The Smurfberry Shop] offers for sale different amounts of Smurfberries. Fifty Smurfberries cost $4.99; 1,000 Smurfberries cost $59." 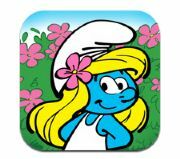 The suit notes that until the Federal Trade Commission launched an investigation into App Store use by minors, authorizing a purchase on the App Store opened a 15-minute window during which a little game enthusiast could do some serious damage - $1,400 in Smurfberries, by one account.